Eliahu ben Shaoul "Eli" Cohen worked as a Mossad agent in Damascus from 1961-1965. Living under the alias Kamal Amin Ta´abet, Cohen developed close relationships with the business, political and military hierarchy and was appointed the Chief Adviser to the Minister of Defense; so respected by his peers, he was considered to be named the Syrian Deputy Minister of Defense. Cohen was privy to national security secrets and was taken for private tours of military installations, though only a civilian. With such access, Cohen was able to supply considerable details on Syrian political and military matters to his operators in Israel. He detailed the Syrian water deviation project and each of the outposts on the Golan, including tank traps designed to impede any Israeli attack. Using his influence on Syrian officials, he suggested the Syrians plant trees on the Golan near each of their fortifications. Based on the eucalyptus trees, Israel then knew exactly where the Syrian fortifications were. 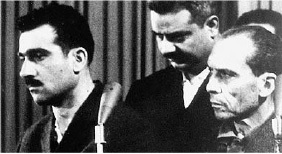 In January 1965, he was caught by Syrian security forces and, on May 18, 1965, was hanged in Damascus´ in Martyr´s Square. The Intelligence Eli Cohen delivered enabled Israel to capture the Golan Heights in two days as part of Israel´s victory in the June 1967 Six Day War.